This was one of those races which you just know will be hard, but don’t necessarily realise quite how hard until you are at the top of a massive hill, trying desperately to get enough feeling back into your hands to be able to open a packet of food, anything to keep you going, when the gale-force winds part the sea of fog just long enough for you to glimpse another rider getting blown off his bike. This would become a battle for survival. Saturday was a fantastic day, blue skies, warm temperatures and a gentle breeze as we made our way across to Douglas on board the catamaran. 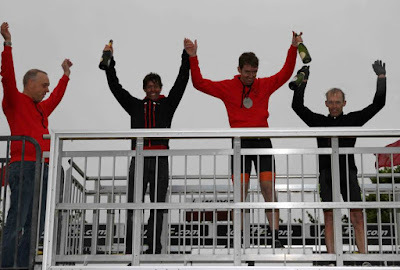 We met a few other racers on the ferry, but despite the lovely weather prevailing at the time we had all seen the forecast and there was a definite atmosphere of gallows humour. It was predicted to be light rain at the start, 6:30am, developing into heavy rain by about 10am and continuing for the rest of the race, with winds of over 45mph. This was of course the forecast for sea-level, whereas we would be crossing the largest and most exposed fells and moors the Isle of Man has to offer, and it is a surprisingly hilly island. have been too numb with cold to opperate the camera anyway. We were met at the ferry port by Guy, a lovely friendly local who had volunteered to put us up for the weekend and who’s wife, Joan, provided an excellent curry while I made him paranoid about his front brake. Signing-on and last-minute detail checking was in the Control Tower at the Grandstand, the same place as last year, before most racers headed off early to their various resting places, keen for a good night’s sleep. I instead found myself accompanying Gina and another bunch of friendly locals on a walk around Rushen Abbey looking for bats. There are over 1,200 species of bat, 7 of which can be found on the Isle of Man. Only 3 are ‘vampires’, none of which are to found on the island. We saw quite a few and got to play with the bat detectors. The alarm went off at 4:45am on Sunday and, upon opening the curtains, I was greeted by the most unexpected sight of blue skies and no rain. Actually, that’s not quite true, the alarm went off at 4:45 but it was 5:15 when I conceded defeat to the snooze button and emerged to open the curtains. A couple of Weetabix later and we were in Guy’s van heading back to the Grandstand. Despite the large banner saying 'Finish' this is the start line. It was still dry at 6:30am, with barely a cloud in view as we all gathered in the TT Pit Lane, ready for the off. The first couple of miles were the ‘wrong way’ along the TT course, lead out by a police motorbike to allow us to jump all the red lights but it was delayed by six minutes (an important detail, remember that) as we waited for the rozzers to get into place. We were all fidgeting, impatient to get off, sensing that we were definitely on borrowed time as far as the nice weather was concerned and anxious not to waste it. I used this time to take my waterproof off and put it back on thirty seven times as I tried to work out if I was just chilly because I was standing still or if it was actually cold and how many layers I would need. A waterproof but no arm-warmers was the compromise I eventually settled on. The neutralised start followed the same route as last year, allowing most of the fast guys, and me, to get themselves to the front, poor Jon Hobson spinning like crazy on his singlespeed as he tried to keep up. He had started the 100 mile event last year but had to concede defeat and switch to the 100km, meaning that the 100 miles had still never been completed with only one gear and he was determined to be the first. The motorbike eventually pulled over, we veered left into the first track and the race was on. 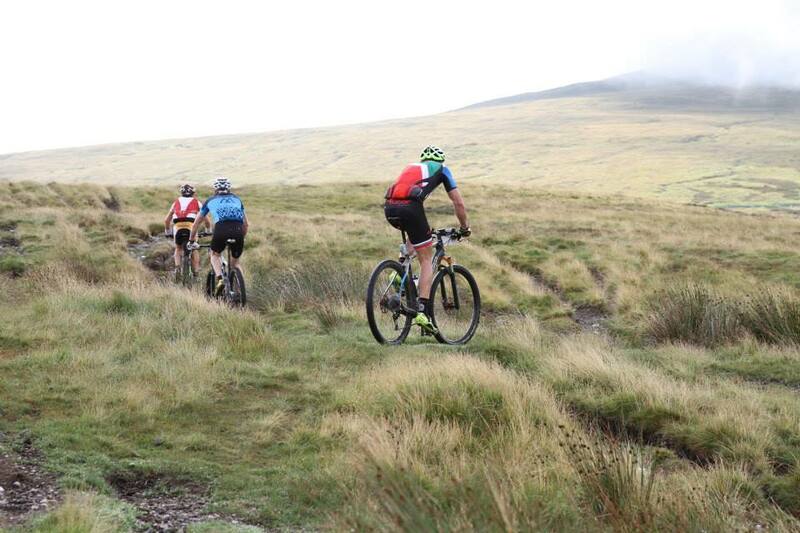 The winner of the 2013 event, Rich Rothwell, and the other likely contender Rob Friel, shot off into the distance with Julian Corlett, who was likely to be the fastest local, and me both trying to keep up as best we could. He managed considerably better than I did and I lost sight of the three of them as another little group formed behind them. It quickly became apparent that I had made the wrong call on the waterproof and I paused to remove it for the 38th time as it was getting rather warm in there. It only took a few seconds but half a dozen riders came passed before I could set off in pursuit. 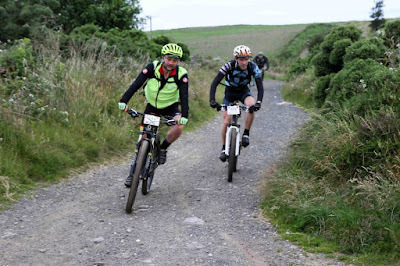 The first section of the course through Conrhenny to Laxey was easy enough, we were all making good progress, trying to keep the speed up while the sun was still shining. The first ‘proper’ climbs slowed us a little as we headed up Slieau Ruy and Slieau Lhean before dropping down into Glen Mona and the first checkpoint just south of Ramsey. 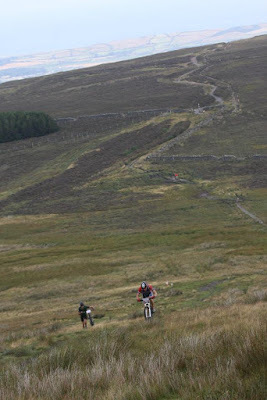 After Ramsey I caught Jon on his singlespeed, still going strongly, and someone else I didn’t recognise and we blasted through the meadows together towards the bottom of Sky Hill, it was like being in a hurdles race with all the gates we encountered. Hmm, MTB Hurdles, a sprint and bunny-hop competition, must remember that one. I recognised quite a lot of the course, having raced here twice before, although not the tight left-hander in Ballure where the sign had blown around and I lost a bit of time faffing with the map. Jon and his legs of steel left me behind on the climb up out of Ohio and passed Slieu Managh, but I could see him again as I approached Checkpoint 2 at the Mountain Box. Checkpoint 2 was very significant for me, mainly because this was one of the three ‘bag-drops’ and I knew that I had a load of food and a new bottle of Torq waiting for me there, along with a set of dry gloves and various other items of clothing. It was the food which I was desperate for, after all of the detailed planning and preparation before the event the one thing I had forgotten to put in my pack for the race itself was anything to eat… I had raided Gina’s supply of things before the start but at about one third distance I was already suffering. I swallowed a couple of Torq bars and a Mars bar and stuffed everything else into my pocket. 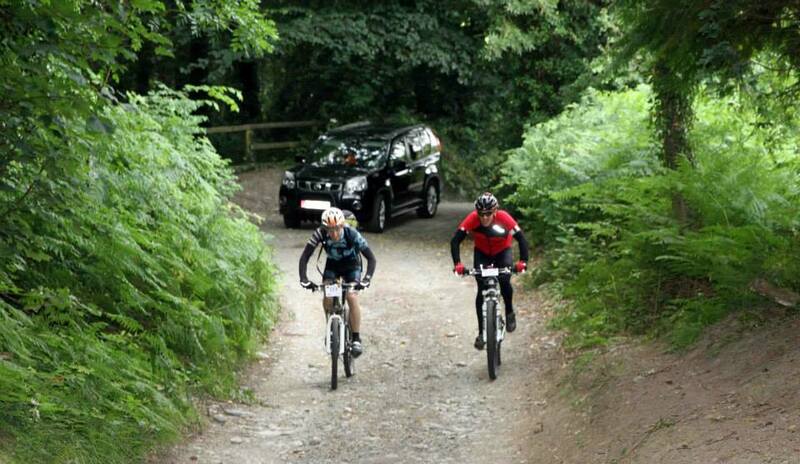 Looking very pro, although that isn't actually my support car. to me, having missed a feed at the bottom. It was 9:48am and much against everyone’s expectation it still wasn’t raining. There was a dampness in the air though, it wouldn’t be long and this high up it was also rather chilly. I put my waterproof on for the 39th time that morning and set off across the moors after Jon, who had very generously waited for me. His singlespeed was less than ideal on this section, but as he was pushing at about the same speed I could ride it didn’t seem to bother him at all. 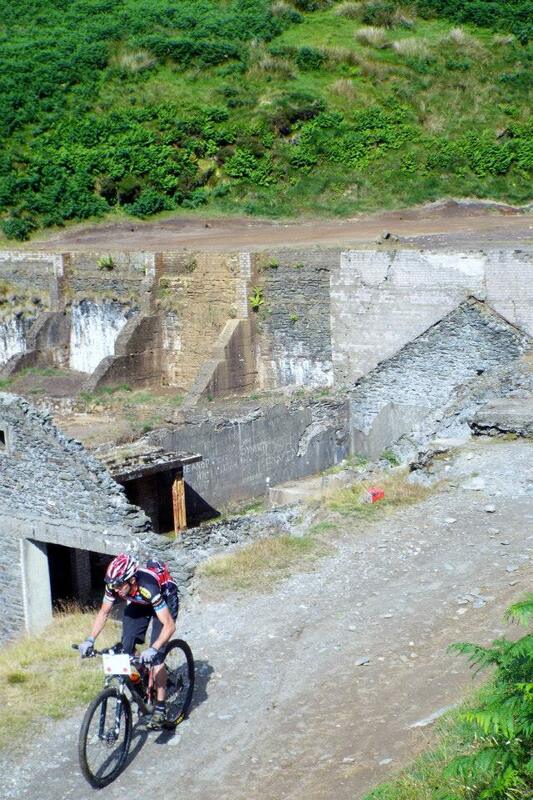 The descent down to the mines at Laggan Agneash was huge fun, one of my favourite parts of the whole circuit. 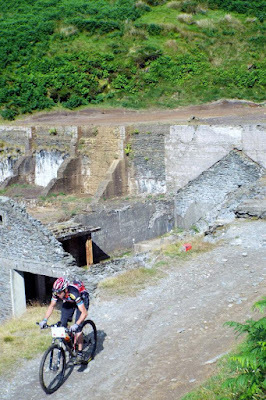 It was pretty steep, down through the ferns, just about rideable with my rear wheel waving about in the air as I tried to keep my speed down enough to allow myself to steer, Jon a few feet ahead shouting warnings about hidden dykes and little skinny, single plank, bridges. If I had had a dropper post I would have pressed the button, but with an ISP there was nothing else to do but hold on and hope for the best. Jon stopped for a pee break at the bottom and I took the opportunity to cram another couple of Torq bars down my neck while I waited for him. Jon at this spot last year. 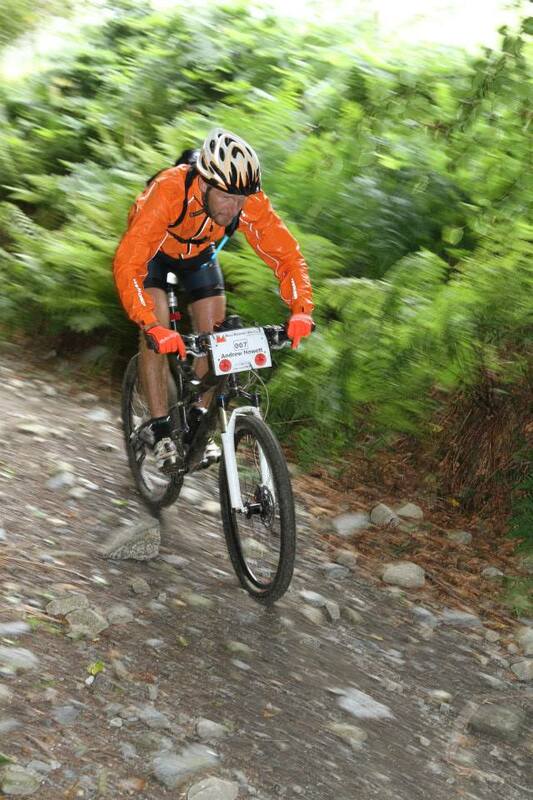 I recognised more of the course, the climb as we left Laxey for the second time was just as hard as I remembered it being. We were heading for the very appropriately named Windy Corner, another famous TT landmark, although we were of course approaching it across the moors, battling into the headwind at 3 or 4mph rather than blasting up to it at 180mph along a nice smooth road. The rain was starting to come in by this stage, gently at first but then harder and harder, but the biggest change was in the wind, it was getting much, much stronger. 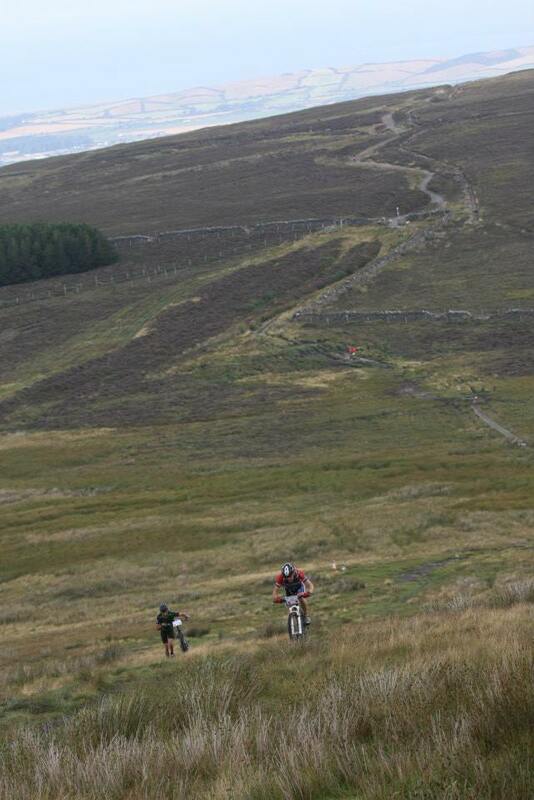 After Checkpoint 3 Jon started to pull away from me. Despite the fact that he had only one gear he was flying up the climbs and I just couldn’t maintain his pace. We fought our way up the back of Injebreck, battling into the gale. The rain was making it incredibly difficult to see where I was going, it was being driven so hard into my face that looking forwards was actually quite painful. However, the fog soon made this irrelevant, when I did manage to look up I couldn’t see anything anyway. 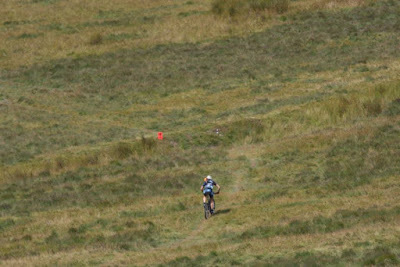 The Manx 100 isn’t one of these well manicured race-tracks with lots of tape and things marking all the corners, it is big hills, mostly in the middle of nowhere, with the odd red and black arrow showing the way. It was an enormous relief when one of those would appear out of the fog, reassuring me that I was still going in the right direction. I have a GPS but it is purely for recording speed, distance, time and such like, it is not one of the fancy ones which show you which way to go and so I was navigating the good old fashioned way, with a map and compass. There were enough signs that It wasn‘t necessary to look at the map very often, which was good as keeping hold of it in the wind was extremely tricky and the rain was making it more and difficult to read every time I got it out, the ink on my print-out running despite the fancy sandwich-bag it was enclosed in. We battled on into the wind, down to Sartfell and then into the relative shelter of Druidale, the sides of valley keeping the worst of the wind at bay. It was a short-lived relief though as soon the route began to climb again, another of those never-ending slogs up and up and up into the clouds. 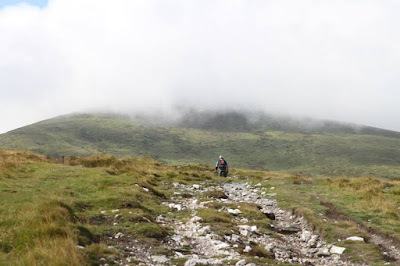 Eventually Checkpoint 4 loomed out of the clag, a man in an enormous waterproof, his hood drawn tight in around his face, his hands blue with cold, while his colleague huddled in the 4x4 trying to keep warm. He asked me if wanted any water. Obviously the fact that I was soaked to the skin and looking like a drowned rat had convinced him that the thing which would make it all better was even more water…However, the second bag drop was still a very, very long way away and so I took the opportunity to refill a bottle. near the end but nothing like this year! Winner, Rob Friel, before it started raining. Another one from last year, in the sunshine. 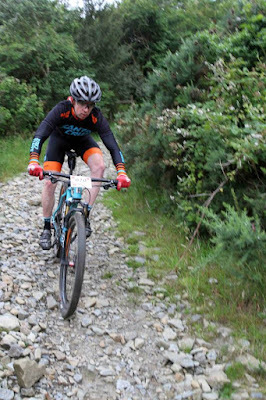 Arrasey was interesting without a front brake, it is normally a lovely swoopy section of singletrack but can be terrifying without any way of modulating your speed. There was one more big climb and then another, even more terrifying, descent before Checkpoint 7, the third and final bag drop where two marshals were waiting for me in a van. It was time to collect yet another batch of Torq bars, and the very welcome pair of dry gloves. It was 1850. The rules said that I had to have passed this checkpoint by 1845. However, the start had been delayed by six minutes and so the cut-off times had been put back by a similar amount. I had a little over twenty miles to go, and had just one minute in hand. This would be tight. There was no time to change brake pads and so I plunged down into Cringle Plantation hoping for the best, the two marshals shouting encouragement over the wind. This is another one of those places which could be huge fun if I had any way of slowing down for the corners, rather than merely trusting to luck and occasionally panicking and sticking my foot out. 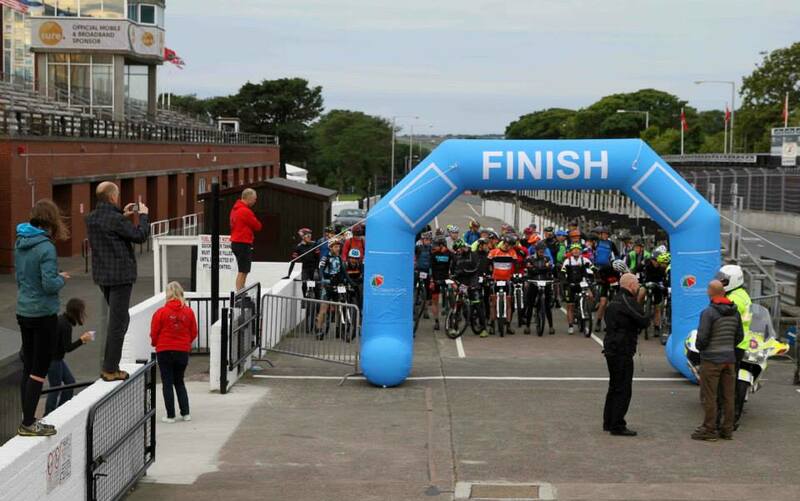 It is also the venue for the Longest Day, Longest Ride event, a 24hr race in mid-June, on a 15 minute lap. The fast boys would get about 100 laps in during the race, which must be as much of a mental challenge as a physical one. In the odd moment of madness I keep threatening to have a go. Anyway, as I headed down through South Barrule my braking ability returned, I have no idea why. 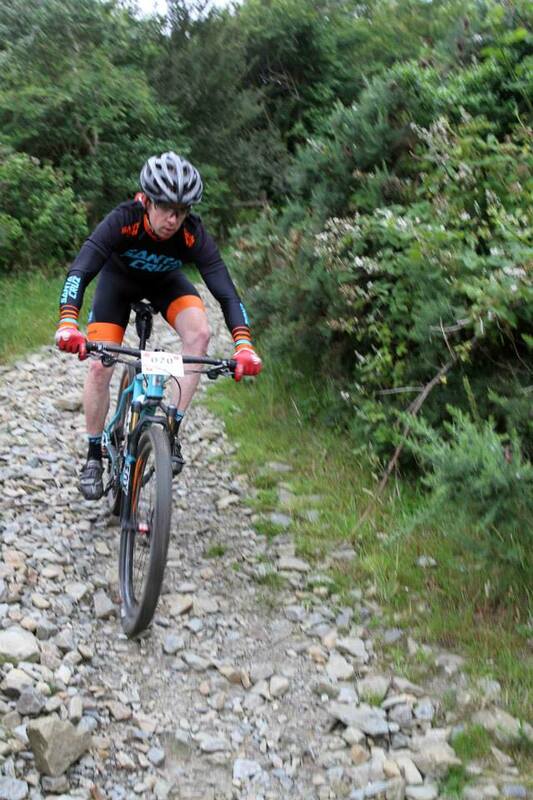 When I finished the race I still had loads of pad left so it wasn’t anything to do with that. The Alligator pads are normally fantastic, I’ve been using them for years without any problems. I can only guess that I must have got some sort of contamination on either them or the disc, a bit of oil or something, and that it had finally worn off. I was so excited by being able to stop that I completely lost track of the route and emerged from the forest onto a road, no signs in sight and no idea where I was. I got out what was left of my map and tried to figure it out, aware that the light was beginning to fade, and with this much cloud cover dusk would be earlier than expected. I wasn’t the only one thinking this, my telephone rang, it was Gina and Guy. He had been ill the previous week and hadn’t been going as quickly as he would normally, and so he was one of those who been sent down the 100km route and had therefore finished early and was now warm, dry and well fed. Gina had tried to convince him that I was very unlikely to quit, but having been there Guy knew just how cold, wet and miserable it was out on the hills and thought I might be tempted. Actually, I was very tempted, but I had come this far, I was going to do this. If I could make the checkpoints in time of course. were a little less obvious in the fog this time! Through the forest, much more fun now I could make it round all the corners and then to Archallagan and the last checkpoint. There was no-one there. I got the map out again, trying to piece together the sodden rags. This was definitely the right place. I phoned in just to check. Yes, I was right, but the last marshal had called it a day and left. I was technically passed the cut-off time but with no-one there to tell me to pull out I was free to continue. The final section of the race was at a much lower altitude and this resulted in a noticeable improvement in the weather. Hardly blue skies and sunshine but at least it was rain I could see through and wind I could stand up in. I got lost one final time as I came out of Chibbanagh Plantation and headed down the hill into Braaid. This isn’t the same Braaid as the one near where the routes split, it is only a little island with not that many places on it which need naming but they do like to repeat the names they do use. This is far from the only example and causes much confusion among those of us from across the water. long since died of hypothermia by this point this year. I struggled back up the hill in the fading light to where I had just come from and then set off in the right direction, nearly there. I had no idea, so described what I could see, really just a very narrow lane lined with ferns taller than me and a little stone bridge. This really was the final section. The official finish was at Kewaigue on the outskirts of Douglas to prevent us all racing through the city centre and causing chaos. Less than half a mile to go. Waiting for me at the end was Nigel’s wife Lisa with the car. I was 13 minutes passed the official finish time, even counting the extra six minutes I was allowed, but I had made it around the full 100 (actually 103) miles and 17,000ft of climbing in one piece. Of the 60-odd riders, some odder than others, who had set off from the Grandstand over 15 hours earlier only 11 had achieved this. I was 11th and last but had a big sense of achievement. I was bundled into the back of the vehicle shivering uncontrollably as soon as I stopped moving, and driven back through Douglas and up to the Grandstand, where Gina, Nigel and Jon were waiting. Jon had only finished about twenty minutes in front of me but in doing so had achieved his target of becoming the first, and so far only, person ever to complete the event on a singlespeed. There was also tea and a lot of cake. 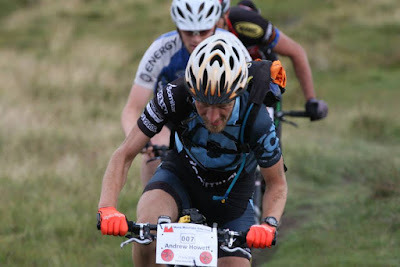 That was a properly hard event, it is probably the toughest one-day event in the British Isles at present and quite a lot harder than most 24hr events. I’ll be back again next year. San Kapil, keen to improve on his 11th place In the 100km, had entered next year’s 100 mile event by the time we got on the ferry to head home! 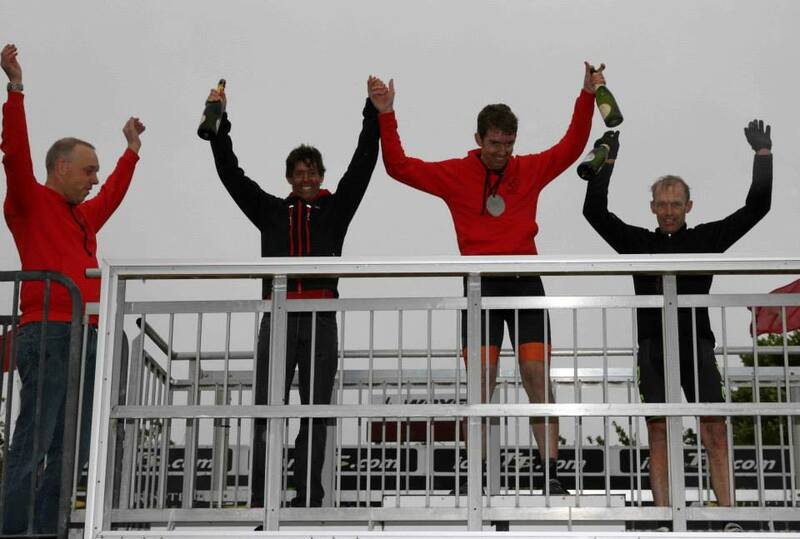 Rob, Ritchey and Julian on the podium with Nigel the organiser. I would like to say a big thank-you to a lot of people, XCRacer/Scimitar, Mt Zoom and Torq obviously. The lights provided by my other sponsor, USE/Exposure, weren’t used this time, although I did find myself on the final trail wishing that I’d put the lightweight Joystick in my last bagdrop. Big thank-yous also to Nigel and the gang who organised the event and to the poor marshals out there freezing to death waiting for me, to Guy and Joan of course, Mr Overshoot and the chaps at the flour mill and especially to Gina. Pictures are all (I think) from Vincent Campbell.